The International Baccalaureate Learner Profile describes a broad range of human capacities and responsibilities that go beyond academic success. They imply a commitment to help all members of the school community learn to respect themselves, others and the world around them. 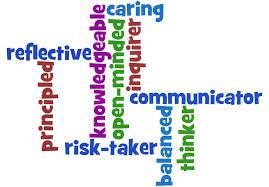 The profile aims to develop learners who are: inquirers, knowledgeable, thinkers, communicators, principled, open-minded, caring, risk-takers, balanced and reflective.